Texas Medical Supply's line of power, lift and mobility chairs provide support for individuals who require sitting and standing assistance. Our chairs are easy to manage and give users independence and control. Whether you rent a chair for a day or purchase one, we guarantee that our equipment will meet your seating needs. Our mobility and power chairs provide ease of transportation, flexibility and comfort. Our standard mobility chairs with a seat belt are available to purchase or rent. We also take special orders for custom chairs and have a range of controls that are available to choose from. We will listen to your unique requirements for efficient mobility. Our specialists will then assemble your custom-designed power chair and conduct safety tests and evaluations. Chairs that meet requirements are delivered. The process takes approximately 10 days. Lift chairs recline, rise and assist individuals who have difficulty moving from a sitting to standing position and the reverse. 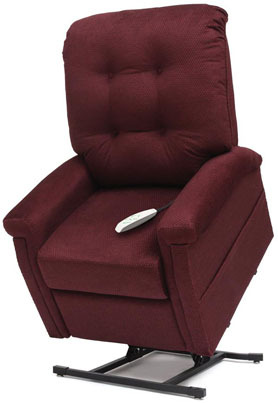 Elders and persons who are infirm or disabled can either purchase or rent from our affordable line of lift chairs. Lift chairs are available in various models designed for an array of special needs. Choose among different colors, sizes, designs and position capabilities. Contact a Texas Medical Supply representative in Houston to learn about our line of chairs and special ordering services. We also serve the areas of Spring Valley, Sugar Land, Missouri City, Mission Bend, Katy, Spring, Pearland, Humble, Pasadena and League City.